Pre-injury, Zena Edosomwan ’17 anchored the Crimson offense as a reliable scorer in the post and an outstanding rebounder. 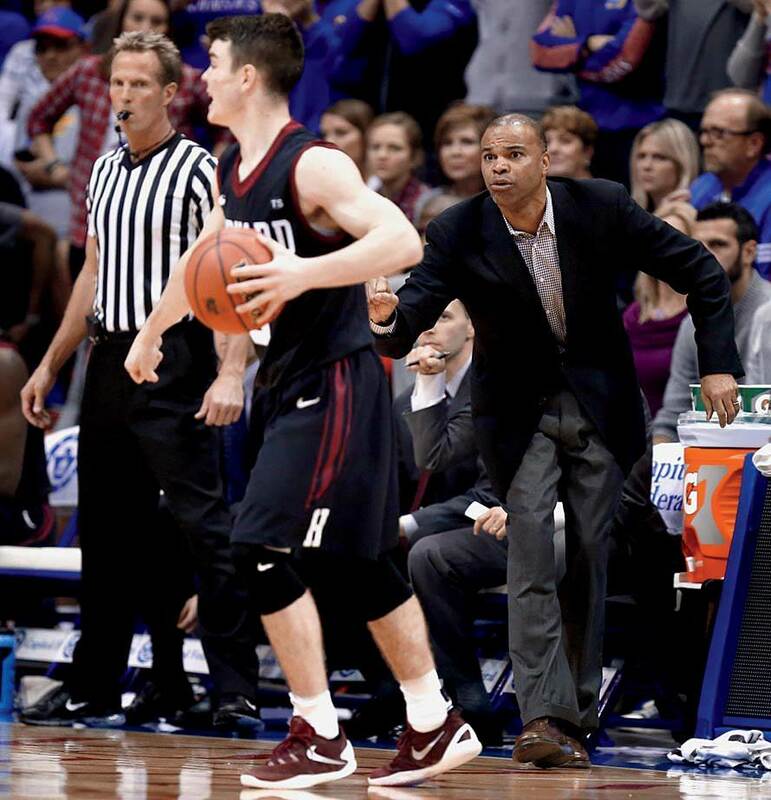 Coach Tommy Amaker is trying to shape a young Crimson squad, including freshman point guard Tommy McCarthy, shown in action against the University of Kansas. Agunwa Okolie ’16 has been the team’s best defender, guarding the opposing team’s best perimeter player on offense and earning national recognition for his impact. One evening in mid January, Zena Edosomwan ’17, the star center of Harvard men’s basketball, stood at the free-throw line for what seemed like a low-stakes attempt. Harvard was playing Ryerson, a Canadian team added to the schedule primarily as a tune-up for Ivy play, and the outcome was hardly in doubt: the Crimson was up by 13 in the second half, and Stemberg head coach Tommy Amaker had been drawing on his bench. Yet Edosomwan—who had struggled with free throws earlier in the season—focused as though the Ivy title were on the line. He took a deep breath as he eyed the basket and then bounced the ball twice before spinning it in his hands. After repeating this ritual three times, Edosomwan bent his knees, rose, and flicked his wrist. The shot was good, but the next attempt clanged off the front rim. The sequence echoes the challenge the team faces this season. After graduating seven seniors from a class that went to four consecutive NCAA tournaments, and then losing star point guard Siyani Chambers ’16 to an off-season knee injury, the Crimson has had to squeeze the most out of its talent, maximizing its opportunities to improve as it plays one of the most difficult schedules in program history and strives to capture a sixth consecutive conference championship. At last spring’s season-ending banquet, Amaker suggested that the 2015-2016 squad had the potential to surprise people, despite losing so many seniors. That comparison rested on the assumption that this year’s Crimson would have Chambers, who had started as point guard since his freshman year. But once Chambers tore his ACL, the question became how such a young team could possibly compensate for his loss. As the season got underway, it was clear how hard this task would be. After dispatching MIT (a Division III opponent) 59-39 in the season opener, the Crimson fell the next night to Providence 76-64. The outcome was not surprising—Providence is led by national player of the year candidate Kris Dunn—but the way it happened was unnerving. The Crimson turned the ball over 22 times; gave up 42 second-half points, a disconcerting number for a program that prides itself on playing high-level defense; and lost another point guard, Matt Fraschilla ’17, also to an ACL tear. There were some bright spots, namely the performance of Edosomwan, who tallied 13 points and hauled in 16 rebounds to earn his first career double-double. But the contest offered early proof that this year’s Harvard squad was not ready to compete at the elite level of its predecessors. The next few games—a 69-63 loss at home to the University of Massachusetts and a 69-56 setback at Boston College—did not allay concerns. Chambers’s replacement, freshman Tommy McCarthy, had 10 turnovers and just one assist during this stretch, and the Eagles torched the Crimson for 53 second-half points. An 80-45 thrashing of Bryant just before Thanksgiving hinted at the Crimson’s potential, but Amaker’s squad followed that performance with a dismal loss at Holy Cross and then another setback, 80-71, to Northeastern. After the game, Huskies head coach Bill Coen encouraged Harvard fans to focus on the bright side, noting that the Crimson were young and had talent that would coalesce as the season continued. Harvard, he said, would be “extremely formidable” by the beginning of Ivy play in January. Amaker echoed the point, emphasizing in his post-game remarks to his players and the press that the team was improving. Still, with a matchup looming against Kansas (then fourth-ranked in the country), things had the potential to deteriorate—quickly. And at first they did: playing in historic Allen Fieldhouse, Harvard fell behind by 16 points in the first half. Then the team staged an extraordinary comeback, tying the game at 56 with just over seven-and-a-half minutes remaining. Although the Crimson ultimately fell to the Jayhawks 75-69, the performance suggested that Amaker’s players were better than their 2-6 record suggested. On defense, the Crimson contained one of the most potent teams in the country, and its freshmen keyed the resurgence on offense. McCarthy nailed three three-pointers (one with the shot clock winding down and two Jayhawks descending on him), and Weisner Perez ’19—until then a seldom-used reserve—tallied 15 points off of the bench. Most important, the team showed that it was not afraid to compete with tough opponents. That strong performance seemed to help the roster coalesce, and the Crimson won four of its next five games. The streak began with a 75-69 win, over crosstown rival Boston University, in which Harvard was led by yet another freshman. Corey Johnson hit six three-pointers, including a shot he made while falling out of bounds with just over 30 seconds remaining—giving the Crimson a six-point lead. Far more impressive was the team’s performance after exams in the Diamond Head Classic, a holiday tournament in Hawaii. After knocking off Brigham Young University 85-82 in a taut opening round game that went to overtime, the Crimson bested Auburn University from the high-powered Southeastern Conference 69-51 in the semifinals before falling 83-71 to Oklahoma (then ranked third in the country) in a game that Harvard led at halftime. Despite entering the eight-team tournament with the weakest profile in the field, the Crimson managed to finish second. Agunwa Okolie ’16 routinely guarded the opposition’s best offensive player, prompting ESPN commentators to suggest that he was one of the best defenders in the country; Patrick Steeves ’16, who did not play during his first three years in Cambridge due to injury, was a significant contributor off the bench, notching 10 points against Auburn; and Edosomwan, who averaged 20.3 points and 13 rebounds per contest during the event, was named to the all-tournament team. 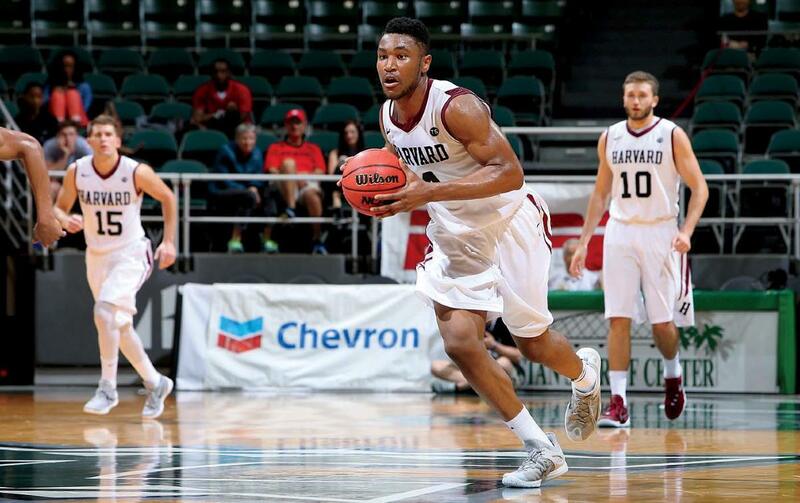 The success in Hawaii, followed by a 77-57 thrashing of Wofford (a 2015 NCAA tournament participant) on December 31, suggested that Amaker’s squad could be a contender in the new year. The first January games, on the other hand—a 65-62 setback at home against Vermont and a narrow 77-70 win over Dartmouth (also at home)—showed that the strong performance in Hawaii was no guarantee of future success. Against Vermont, turnovers (17 total) again plagued the Crimson. And injuries continued to mount. After tweaking his knee against Wofford, Steeves did not suit up against the Catamounts, and McCarthy left the Vermont contest after hyperextending his knee midway through the first half. Most alarmingly, the Crimson failed to generate offense when the Catamounts double-teamed Edosomwan. The contests signaled the kind of challenges the Crimson was apt to face within its conference. Unlike the opponents Harvard faced in Hawaii, Ivy League teams tend to play at a slower pace, which requires more patience and discipline on defense. 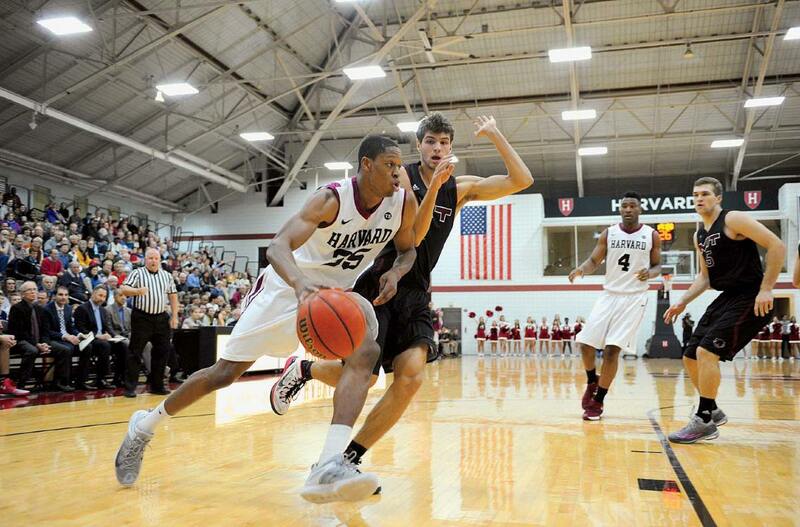 Ivy rivals are also familiar with the Crimson’s strategy and personnel and eager to defeat Amaker’s squad. After completing non-conference play by dispatching Ryerson 73-57 and narrowly beating Howard 69-61, the Crimson faced just 13 regular season games in a tightly contested league—and immediately experienced one of its most difficult stretches thus far. First came a 63-50 loss in its rematch with Dartmouth in Hanover, in a game that it led by 11 points in the second half. Next the squad lost back-to-back home games to Cornell (77-65) and Columbia (55-54). That dropped Harvard to 1-3 in conference play, three games behind Yale and Columbia, then sharing first place in the Ivy standings. As the injury-plagued Crimson faced the heart of its league schedule in early February, its margin for error was as slim as a single free throw.